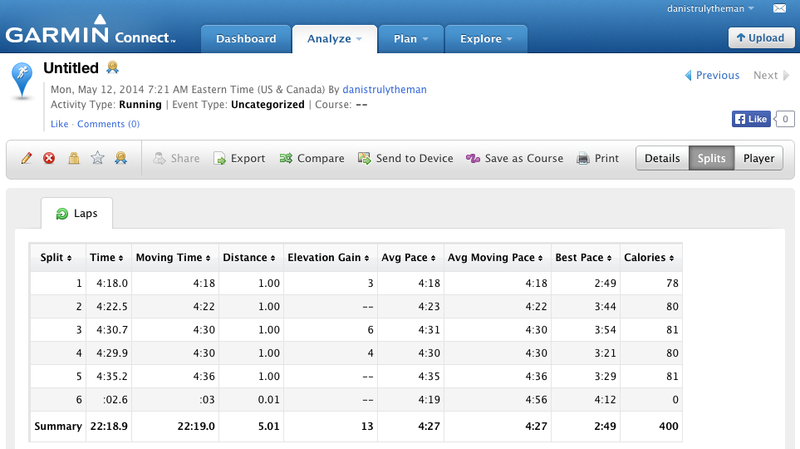 A new PR (Garmin PR) … beats yesterday’s time by a minute. I think it’s my 3rd fastest ever. I rarely run 5Ks. The 1st time I did last year, I stopped the clock at 22:02 and was pleased enough – although I did run it again to better it. I know I’d rather run 4Ks … or run through 5 kilometers and stop at 8K, or 10K. I know running hard up the hill to stop the clock isn’t my favourite thing – I’d rather push hard up the hill, and then know my run is flat for the next few kilometers. 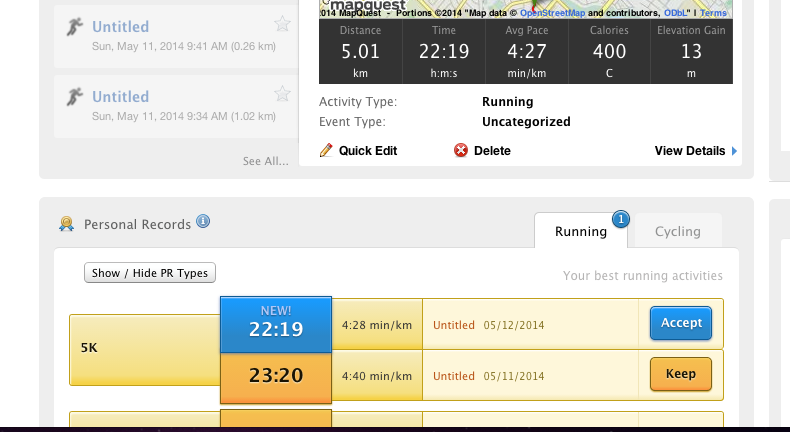 I’m happy w/ today’s time – I love running 4:30s – 4:25s … but right now this is my distance limit doing so. I remember last year carrying that pace for 8K, 10K. Looking back, I see I was a streaky runner; I’d run fast times for days straight, then suddenly wouldn’t be able to match them. In fact, I PRed my 8K runs on back to back days. Almost identical times too … and that’s what I’m talking about when I say carrying my speed, my 8K record run, I ran the final 4K in 17:42 … negative splits. But for the most part, all the kilometers would be run very evenly. I don’t have the stamina right now. That’s why today’s run was good, is important to me – I really have no interest whittling down today’s time by much – I really want to run this pace farther. I want to run this, and then run it AGAIN continuously for a solid 10K time. Categories: running | Tags: 10k time, 5K, Garmin | Permalink. … looking down seeing that 4:18 surprised, AND scared me!! At that point, I hunkered down w/ pedal to the medal as far as it’d take me! … would be fun running w/ you … you’re THAT much faster than moi … least, I know I would benefit, lol!